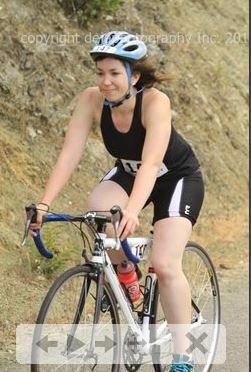 I’m pretending to be happy, but in reality, this bike fit me terribly and made my first triathlon a little miserable. Triathlons are expensive. Many of the costs, apart from race registration, are one-time purchases, but biting the bullet and shelling out hundreds of dollars for a bike takes courage I don’t yet possess. It’s just a matter of time as to when I decide to buy a bike – I’m registering for Wildflower and Vineman next year, after all. Most of my workout clothes come from Old Navy and Target. I think I’m the only 26-year-old in San Francisco without one of those reusable Lululemon bags or Wunder Unders. I also refuse to buy decent sports bras, instead preferring to layer multiple sub-par ones. I’d like to see for myself if better quality workout clothes truly make a difference in my workouts. Jesse uses a Jawbone Up to track his steps and sleep patterns, and I’d love to see how my own stats stack up with my own Jawbone Up or Fitbit. I’m not very interested in the food tracking aspect, but calculating my vitamin and micronutrient intake would make for an interesting personal assessment. I’d love to try CrossFit, but the fitness craze is way too expensive for me to justify. If I’m too cheap to buy high-quality sports bras, there’s no way I’m shelling out several hundreds dollars per month to workout at the “box.” In San Francisco, rates are substantially higher than they are in the suburbs (no surprise there), so I won’t be trying CrossFit until I move out of the City. I often find myself fidgeting with my headphones when I’m running. Wireless headphones would help prevent me from taking my eyes off the road and adjusting my headphones while I’m running. I would LOVE to have wireless headphones, I always hit the chord and knock them out of my ears! I get almost all of my workout clothes from Nordstrom Rack, TJ Maxx and Marshalls. You can still find some high quality brands without breaking the bank, but the selection can be hit or miss. Also, the Sports Authority in Daly City is going out of business so I’m sure you could find some great, inexpensive gear right now! Your number 1 is my number 1 right now. I am still trying to figure out just what I want. All of those are great! As a fellow triathlete with a nice bike (and a bike commuter with a crappy bike), I can tell you that shelling out the cash is definitely worth it. Sports bras are also worth it. Like, really worth it.